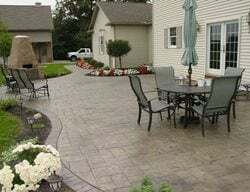 Approximately 1,500 square feet of residential stamped concrete pool deck with multiple acid stain highlights. 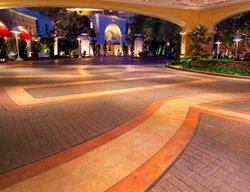 Stamping and integral coloring were used to create this look at La Gran Via shopping mall in El Salvador. Read more. 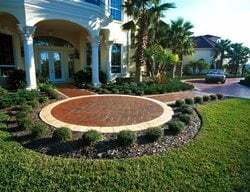 This project consisted of five stamped concrete arches, connected by regular concrete enhanced by decorative sawcuts. 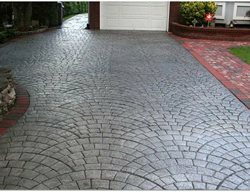 Read about how this multi-colored stamped concrete project was installed. 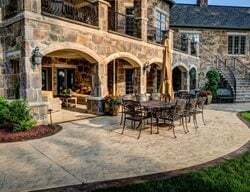 This new poured pool deck was stamped with a Bush stone pattern and colored using sun buff hardener and an autumn brown release. The borders were stained with Smith’s water based stains. 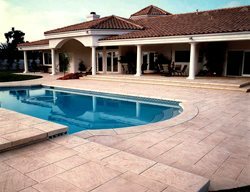 This residential pool deck was stamped with an ashlar slate pattern. 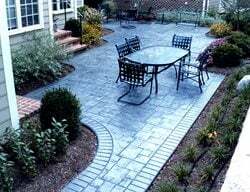 A seamless slate pattern was use to outline the pool and create a design through the ashlar slate. 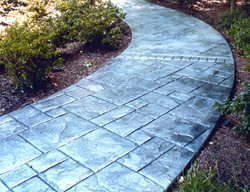 The colors used were gray and a darker shade of gray for contrast on the seamless slate. This commercial parking area at Hunter Industries Facility in San Marcos, CA was a new pour concrete surface with dusted on color and stamped with a small and large sandstone pattern. The unique texture on this pool deck at a residence in Mason, OH was created through slate textured stamps. The colors used were Adobe buff hardener and Terra cotta release. The cantilever coping was also textured and colored to match the decking. 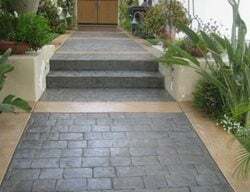 A set of steps poured using liners on the inside of our step forms to create the look of real stone and slate steps. 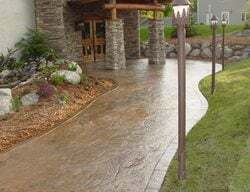 This walkway was colored using sand stone base color and then antique autumn brown release agent. 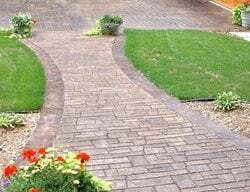 The pattern was used was a small ashlar slate stamp placed at a 45 degree angle. The stamp pattern was framed with a 6 inch border and bands. This Urban renewal project at a large complex in Pennsylvania, involved 1,800 sq. ft. of interior concrete floor; the concrete was integrally color using Scofield’s summer beige with a contrasting charcoal release agent. 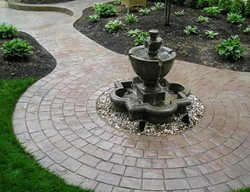 The stamp pattern used was random flagstone.